Today we’ve been reflecting on the young lives lost over the past days on the streets of our beloved East London. It’s tragic. And so far removed from our own experience of growing up — me in Ireland, Kay up north. We had our teenage troubles, but nothing close to the kind of stresses that vulnerable young people in our neighborhoods face today. Knives, guns, postcode boundaries, drugs, family breakdown, poverty, social media, exams, you name it, they’ve got to deal with it. 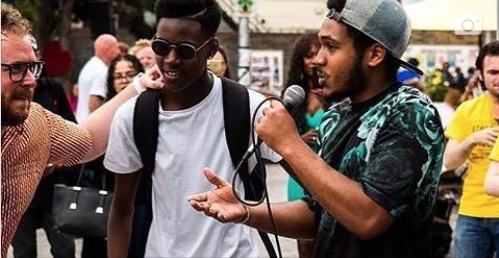 That’s why we feel really privileged that The #Artskickers Urban Symphonygives us the chance to show off the talent, heart and soul of East London’s young people. On April 21, thanks to funding from Arts Council England and Galliard Homes, a group of young creatives (ages 12–20) from across East London, accompanied by the musicians of Street Orchestra Live are getting on a bus and taking their symphony on the road. Hackney, to begin a collaboration that will inspire others. They’ve signed up to this exciting new experience, their postcodes are not a dividing factor for them. They’ve come to create art. They’re taking a chance on us, recognising the support of people like Renell Shaw who can see how bright their future is. Their youth club facilitators have given the ok, their #art can have a positive impact. That’s pretty brave, would you agree? We’re confident the experience will develop their talent, skills and passion, but ultimately their commitment will enable us to reward the people who foster those talents in them. The work of these young people will shine a light on their talent and uncover the #Artskickers who work so hard to create pathways into the arts for young people all over East London. That’s kinda generous of them, don’t you think? On April 21, The #Artskickers Urban Symphony hits the road. Starting in Barking, they’ll continue to Westfield Stratford, Mile End Park, Dalston Curve Garden, Walthamstow and finish up at The Green Rooms in Haringey. They’ll be joined in each location by local dancers and performers*. So here is our invitation to YOU. Come out and show them you love (yes, LOVE) who they are and what they’re doing. That you think they are brave and generous and that the future is safe in their hands. Come show your solidarity, raise your spirits and get down with The #Artskickers Urban Symphony. If you’re a dance troupe or an arts organisation and want to show us your stuff — come on down. If you’re a human being and in need of a cheer up — come on down. If you’re a frazzled parent with kids to entertain, we’ve got you covered — come on down. Everyone’s welcome. April 21. See you there. If you’d like to sponsor our efforts, we would love to hear from you. We need lunch, drinks, t-shirts, photos and a videographer — HELP! *If you’d like to participate in your area, let us know you’re coming so we can slot you in.